Nothing was staged here. Don't even know the lady. Just a candid and genuine street shot that portrays sadness (to me at least). When I have my camera with me and I am out on the streets, I am constantly looking to capture interesting moments. This is one of my better finds. The tones in this are spectacular Adam!!! Beautiful image that tells a story!! Congrats again and again!!! An amazing capture. Congratulations on the Ribbon. Got high marks from me. Nicely captured! Bravo on the ribbon!! Great find, indeed. Love this shot and post processing. Congrats on Red! Allen, Great find and an artistic processing... congrats on the ribbon! Great capture, and to echo Dave, I love the tones and textures. Congrats! Thought this would do well. Had this somewhere near the top myself,Congratulations. Excellent shot, congrats on the red! When I'm in Italy, I often try to capture moments like this but never got it with this perfection. Congrats on the ribbon, this was my favorite by far. Fantastic capture Allen. One I kept coming back to look at. Love the tones and textures as well. It's starting to become very habit forming for you to be on the front page this month. Congrats! I'm glad to see this ribbon! nicely done and congrats! Wow powerful stuff, I reckon you'll win a ribbon out of this, probably the bluey. I find the processing a bit too sentimental, but the composition and framing are fantastic. Grain ... Black & White ... Perfect for this image. So very poignant. Sadness pervades this. Very nice processing and works well for the challenge. I like the way you positioned the woman down in the corner, off to the side and neglected, facing off frame; and the reciprocal gesture of the lamp pointing off and away keeps balance beautifully. The rest of the frame is dense and busy with lots of good textures. Top two in my book. That is really sad! I love the B&W conversion, the composition and texture. Very nice dynamic tones in the B&W! I really get the strong sense of the old world from the picture - the buildings and the hanging of the wash to dry cements the idea. I like the gritty feel feel of this - the B&W brings out the tones and textures and a feel of the day ending by the looks of the waning light. 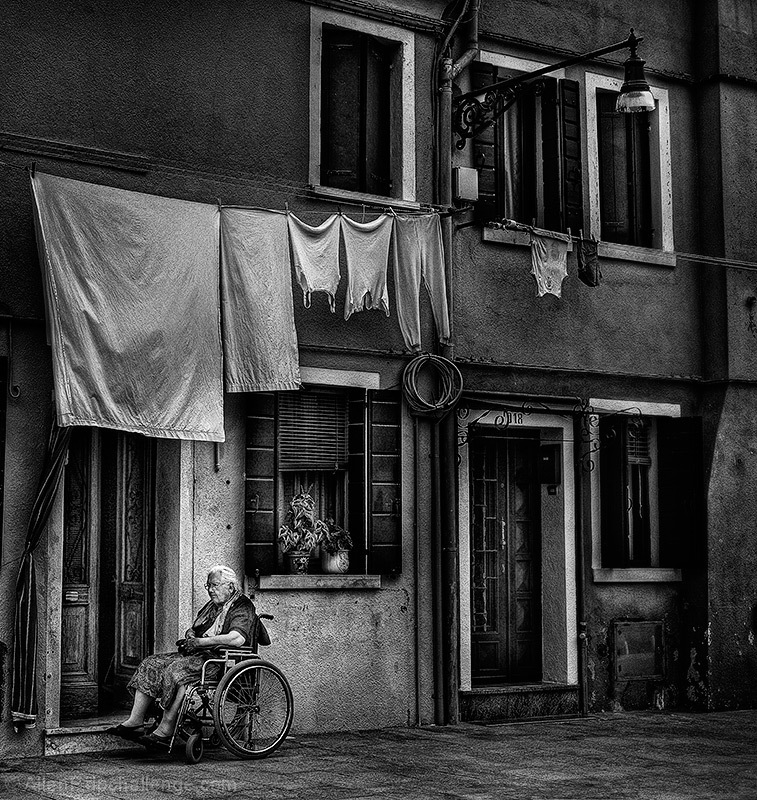 The sadness comes from viewing the elderly woman alone in the street. She is limited in where she can go by her disability. The door she faces is slightly ajar but because she is confined to a wheelchair she has no way to get inside without any help - and there is no one in sight. I get the strong sad sense she is facing her end of days confined to her wheelchair alone without much company. I like the texture and grain in this. Nice photo. Good luck. Magnificent shot and fantastic processing. Excellent, a pleasing sense of sadness, if thats possible. Proudly hosted by Sargasso Networks. Current Server Time: 04/24/2019 03:57:26 PM EDT.